Business, like life, has an ebb and flow. From startup to high growth to plateau … it can be a wild, wonderful ride. For some, the journey includes unanticipated changes in ownership structure, which is where David Aschheim, CEO and local franchise owner of Sola Salon Studios, found himself several months ago. Aschheim wanted to do some research before approaching his partner about the subject, so he looked for guidance and advice from area consultants. His goal was to come to an agreement that would benefit both of them, but he wasn’t sure where to begin. Aschheim found the conversations he was having with area consultants lacking. “I had spoken to some consulting companies and other people, and I wasn’t quite satisfied that they were understanding and internalizing the challenges I felt I was facing,” he says. 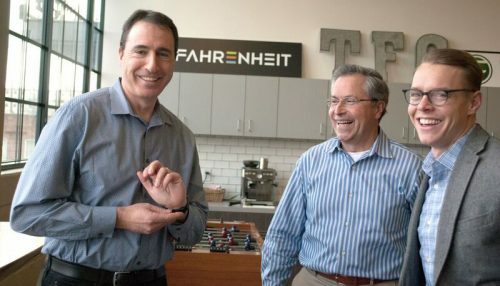 Following the advice of a friend, he contacted The Fahrenheit Group and met with Co-Founder Keith Middleton, who immediately connected him with two team members, Lud Kimbrough, Managing Director and Jeff Wraley, Senior Consultant. Aschheim needed help on two fronts. First, he needed to confirm the business’ value. Second, he needed a strategic thinker to guide him through the conversation with his partner before it happened. “Jeff, with his finance background, fit the bill very well, I think, because he was able to very quickly adapt to what’s a relatively simple company, but, like many small, understaffed, fast growing companies, we were constantly catching-up. The Fahrenheit Group helped with the resources I needed to value the business,” explains Aschheim. “He did some things that I thought were fantastic and made it easier for us to work from a standard starting point and more able to change information as we moved through the transition process,” Aschheim adds. After building a financial model, Aschheim then worked with Kimbrough on zeroing in on what he really wanted out of the new business arrangement – and techniques to keep his emotions at bay. “The combo of Jeff and Lud was very effective,” he adds. Since buying into the Sola Salon Studios franchise system in 2009, Aschheim has opened six locations in Richmond, two in Newport News and one in Chesapeake. His newest location opens in Williamsburg in April 2018. All told, his business supports three full-time employees and seven contractors. Aschheim says the Sola Salon Studios franchise organization, based out of Denver, Colorado, is the largest operator of studio salons in the country. What has life been like since he and his business partner finalized the buy-out agreement? Life now, for this CEO, is good. Are you a CEO in need of some guidance or strategic support? Call (804) 955-4440 or send us an email today! We’ve got a team of professionals standing by, ready to assist. « What Keeps You Awake at Night? Ask Why!